Credit: Courtesy of Sacré-Cœur Parish. 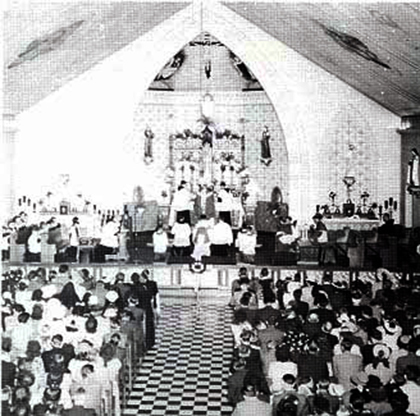 Church service, Sacré-Cœur Roman Catholic Church, n.d. The neighbourhood that became commonly known as "French Town" was established in this area in 1918, when approximately 20 French-Canadian families arrived from Quebec to work at the Empire Cotton Mills plant. The Roman Catholic Parish of Sacré-Cœur was established in 1920 and became the cultural centre of the francophone community that developed around Empire Street. 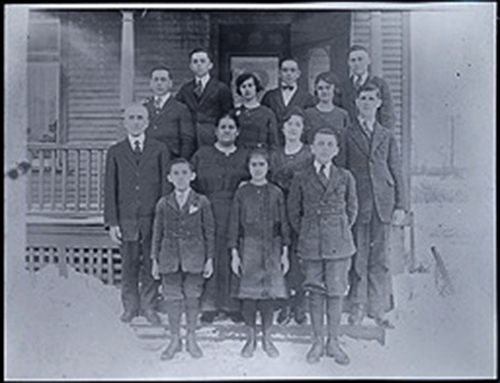 Additional French-Canadian families arrived from Quebec, New Brunswick and northern Ontario throughout the 1920s. Another wave of francophones moved here at the outset of the Second World War, attracted largely by employment opportunities in local industry. Visit the plaque – In front of the Sacré-Cœur Roman Catholic Church at 72 Empire Street, Welland. Credit: Courtesy of Sacré-Cœur Parish Church service, Sacré-Cœur Roman Catholic Church, n.d.